The Season 14 premiere of Supernatural finds Sam Winchester (Jared Padalecki) holding things together at the bunker while the Archangel Michael (Jensen Ackles) walks the Earth trying to understand what exactly everybody wants. “Stranger in a Strange Land” was written by co-showrunner Andrew Dabb and directed by Thomas Wright. The episode served to bring current viewers up to speed while providing at least one surprising reveal. In a long-running series like Supernatural, the season premiere has a lot of ground to cover. The audience needs to understand how each of the characters have changed since we last saw them, the groundwork for the new story arc needs to be established, and unfinished business from the previous season needs to be cleaned up. The job is made that much more complicated with a cliffhanger like Michael breaking his deal and walking off with his newly possessed Dean Winchester vessel. “Stranger in a Strange Land” hit all its marks, even if the handling of Supernatural canon left a little bit of a mess. Supernatural has been followed by a passionate fanbase for more than a decade. Every day new viewers are discovering Supernatural on Netflix and other online sources, but Season 14 isn’t waiting for them to catch up. Watching “Stranger in a Strange Land,” we couldn’t help but think how lost a new viewer would’ve been wading into the series for the first time. 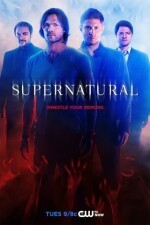 The current writing seems more focused on telling an engaging story to the Supernatural fanbase than it is on bringing in new viewers to watch live on The CW. Let’s face it—live TV is kind of a dinosaur. With Dean being possessed by Michael, Sam is large and in charge. Sam is searching for his brother, directing the Apocalypse-world refugees on hunts, giving a disempowered Jack pep talks, and rescuing pals. With Dean out of the picture, Sam is finally getting the one-on-one time with his mother he’s craved all these years. Yet, somehow, without Dean around, it’s awkward. Sam and Mary (Samantha Smith) finally open up to each other about their fears, but still only seem to connect through Dean. Though Mary hasn’t really bonded with Sam yet, she seems to have made a connection with Alt. Bobby Singer (Jim Beaver). Castiel (Misha Collins) is captured, ridiculously easily, by a group of demons and their wannabe King, Kip (Dean Armstrong). The extent of Castiel’s power has been much debated since the fall of the angels. If you had hoped that Cas had his full angel strength back, this episode should dissuade you of that notion. Castiel could only watch from a chair while his friends engaged the demons in a fight straight out of West Side Story. After spending half the episode learning about Kip—his travels with Genghis Khan, his taste for human flesh, and his desire to be the King of Hell—the ambitious demon is dispatched by Sam. Before they flee, Sam warns the remaining demons, “There will be no new King of Hell. Not today. Not ever. And if anybody wants the job, you can come through me.” We’d like to think that Sam was sticking up for Crowley—the one true King—but we know that Sam was reminding us all that he’s not someone you want to mess with, even without his brother by his side. “Stranger in a Strange Land” provides an opportunity for several actors to play different versions of their characters. Alexader Calvert (Jack) is still the same character, but a version of Jack who has to learn how to exist without his powers. Calvert manages to exhibit this shift through his dialogue presentation, but also through his physicality. He appears younger and far less confident. Mark Pellegrino plays Lucifer’s former vessel Nick, a character he hasn’t played since Season 5. Jensen Ackles plays Michael with more formality and restrained power than his Dean Winchester role. Ackles has shown skill taking on different characters in the series, so watching him inhabit this new role was one of the more interesting aspects of this episode. While Sam’s fighting evil and protecting the helpless, Michael (Jensen Ackles) has been traveling around the world with Dean as his vessel. Michael has been approaching holy men, leaders, and killers, asking them what exactly they want. His interest is peaked by the rebel angel Sister Jo (Danneel Ackles). When he asks her want she wants, she jokes, but he tells her what is it she wants: “Love. To belong. To have a place. A home. A family. It’s very, very human of you. And so, so disappointing.” Scenes between this real-life husband and wife provide a bit of extra excitement for fans. Now that Sister Jo has been in contact with Sam, we hope to see more of her. Michael seeks to transform this world, beginning with the recruitment of a monster militia. “Stranger in a Strange Land” doesn’t create a ton of excitement, but it effectively lays the groundwork for Season 14. With so much going on in this episode, the Nick reveal might have been better saved for a later time, though it’s always fun to see Mark Pellegrino. The cast performances were one of the strengths of this episode. Despite a fragmented narrative, “Stranger in a Strange Land” serves to reinforce the themes of Supernatural—saving people, hunting things, and a commitment to family. Sam tells Castiel he would do anything to save his brother—a common thread throughout the series. Similar to Demon Dean or Lucifer using Castiel as a vessel, Michael possessing Dean creates a different family dynamic. Sam won’t be working alongside his brother, but against the very thing that has taken Dean over. It’s strange to imagine, but it might be a while before we see Dean Winchester again.